An anti-ageing formula designed to correct sun-damage, fine lines and wrinkles. 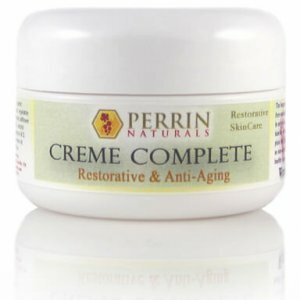 Creme Complete will also assist in conditions like lichens sclerosis. 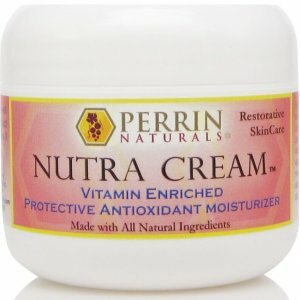 This is an anti-ageing formula for sun-damaged skin, rosacea, age spots, lichen sclerosis, abnormal skin tissue, and overall skin health. Creme Complete is a highly concentrated cream that will deeply moisturise and protect. Lichen Sclerosis has been put into remission, and the skin rebuilt. 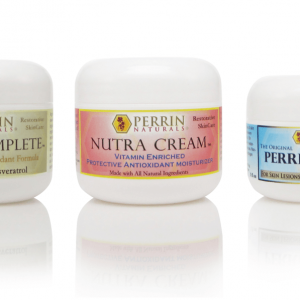 Many customers in America are referred by their doctors, without Perrin Naturals ever contacting the doctors. 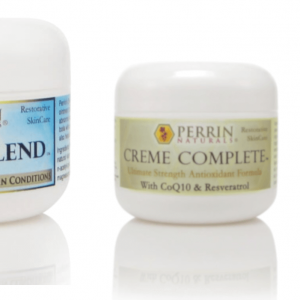 If your skin condition is severe you may need to consider combining the creme complete (during the day) with Perrin’s Blend (at night). Resveratrol and grape seed extract are powerful antioxidants that not only help to stop the growth of abnormal skin cells, but encourage these abnormal cells to self destruct. CoQ10 gets your skin breathing and fully functioning thus slowing the ageing process. Organic aloe vera, grape seed oil, beeswax, vegetable glycerin, organic cocoa butter, natural vitamin E in soy oil, organic castor oil, vegetable derived emulsifying wax, almond oil, organic safflower oil, organic extra virgin olive oil, honey, lavender oil, lecithin, vitamin C, n-acetyl cysteine, resveratrol, alpha lipoic acid, sodium bicarbonate, grape seed extract, coQ10, biotin, vitamin A & D, lemon oil, frankincense oil, peppermint oil, germanium oil, cornstarch, cream of tartar, and rice flour.